Advertisements, (left) the Globe and Mail, March 27, 1965, (right) the Globe and Mail, March 20, 1965. The Toronto Star dubbed it “the biggest shot in the arm” the Canadian art world had ever experienced. Four hundred paintings, worth over $100,000, were purchased by Hollywood horror icon Vincent Price in August 1963 to be sold as part of the retail art collection he curated for Sears, Roebuck and Company. Sears vice-president of merchandising George Struthers approached Price in the early 1960s as part of the department store chain’s attempt to boost sales through celebrity advisors (its sporting goods committee included baseball great Ted Williams and mountaineer Edmund Hilary). Price, whose lifelong passion for fine art expressed itself through books, media appearances, and lecture tours, was assigned to purchase works from around the world. Besides rising talents, artists represented included the established (Salvador Dali, Man Ray, Andrew Wyeth) and the historical (Albrecht Durer, Francisco Goya, Rembrandt). Launched in Denver in October 1962, the collection allowed Sears customers to buy the paintings and sculptures for as little as $5 down and $5 per month. The works were sold via catalogue and touring exhibitions at stores across the United States. Though not profitable, the collection provided Sears with prestige and publicity. Rivals such as Macy’s launched their own art programs, but they lacked the cachet associated with Price. I’ve been a collector all my life and never having been a very rich one or interested in terribly expensive paintings for myself, I’ve learned to buy extremely well. I think 90 percent of the people I know around the country are scared to go into a gallery. They seem to be awed by it, which is nonsense of course, but that’s the attitude we’ve had in America for decades. In June 1963, Simpsons-Sears invited Price to bring his collection to Canada, with the caveat that he include homegrown artists. 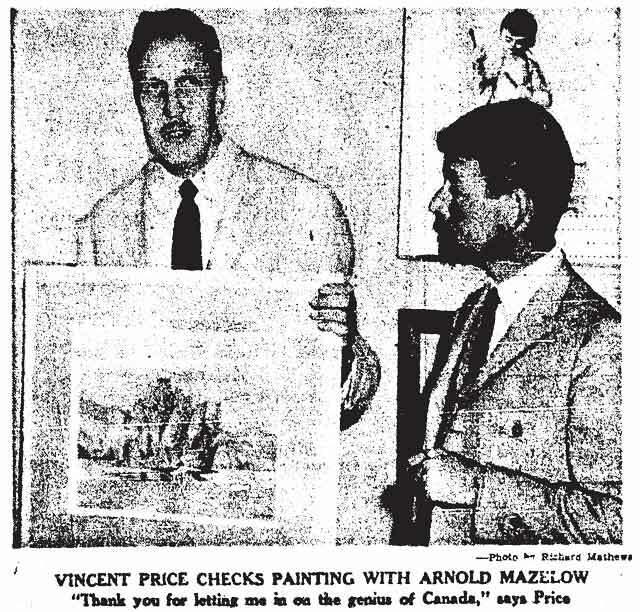 Price hired Toronto gallery owner Arnold Mazelow to select appropriate works. Mazelow took two weeks to assemble a list of 600 pieces, which Price then narrowed down to 400. Though historical works were chosen, many were produced by contemporary artists such as A.J. Casson, William Kurelek, Jean-Paul Riopelle, and Harold Town. Simpsons-Sears planned to display half of the works at three stores during the fall of 1963, and the remainder were added to the 20 roadshows touring the United States. “Thank you for letting me in on the genius of Canada,” Price wrote to Mazelow, whom he instructed to line up another $100,000’s worth of art within six months. 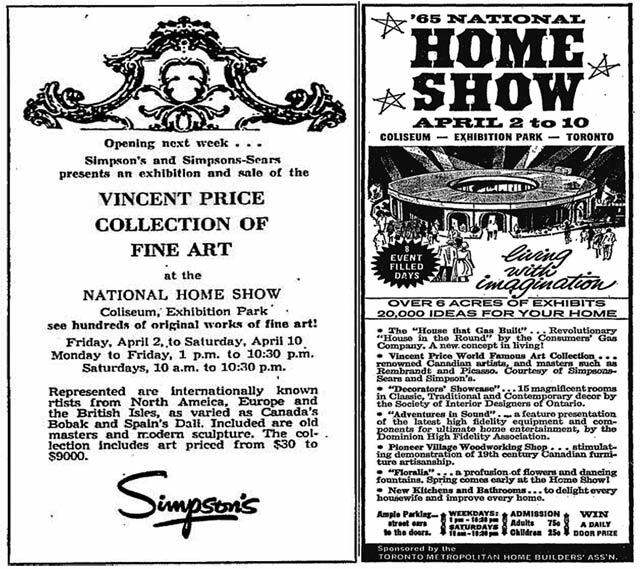 Price appeared at the CNE Coliseum in April 1965 to promote an exhibition at the National Home Show. Of the 1,000 pieces displayed, the priciest was an 1861 Cornelius Krieghoff painting of the Caughnawaga tribe ($7,850). Visitors to the collection tread through an exciting maze of panels and blocks holding the sculptures. No attempt has been made to present the work in schools or by country. At the entry, a Riopelle hangs in harmony with a Toronto street scene by Albert Francks. Inside the entrance the Krieghoff shares the same panel with a Harold Town, his “Radar Detecting Fall,” priced $975. Source: the Toronto Star, September 23, 1963. Besides helping local artists earn money, Price had an impact on the Golden Horseshoe arts scene in at least one other way: he appeared in the CanCon kids classic The Hilarious House of Frightenstein. Additional material from Vincent Price: A Daughter’s Biography by Victoria Price (New York: St. Martin’s Griffin, 2000); Simpsons-Sears: The First Twenty-Five Years (Toronto: Simpsons-Sears, 1979); the April 2, 1965 edition of the Globe and Mail; and the September 23, 1963, and January 28, 1967, editions of the Toronto Star.